Vehicles that bring goods to homes and businesses in the “last mile” of delivery will be the first to undergo electrification, but the sector itself is ripe for more than just powertrain disruption. That’s the consensus of UPS, Chanje and Workhorse Group executives speaking at a panel on “the last mile hurdle” at the ACT Expo green vehicle conference in Long Beach, Calif., Wednesday. There’s more to it than just building and deploying electric vehicles. To Chanje, a Los Angeles-based electric-vehicle manufacturer, the trucks are only a foot in the door. Chanje is isn’t focused on vehicles or any one solution, said Austin Hausmann, the company’s vice president of product development and R&D. “We like to think that we’re trying to solve a bigger problem and we know that vehicles are a very small piece of a complex puzzle,” Haussmann. “Trucks are for us what books were to Amazon – the stepping-in point,” he said. Currently Chanje has a Class 5 extended-base electric delivery van – the V8070 – that offers 6,000 pounds of maximum payload capacity, 675 cubic feet of delivery space and more than 150 miles of range from a 100-kilowatt-hour battery pack. It also has a partner in leasing giant Ryder System Inc., which is charged with sales and maintenance. Infrastructure also is a priority. Chanje is developing measures to scale adoption of its electric delivery vans for fleets of all sizes. This includes grid services – the interconnect between the vehicle and grid itself – and charging infrastructure. This is the “pathway” to fueling the vehicles emissions-free and in a 100 percent renewable environment, Hausmann said. Autonomous driving removes the driver – one of the largest operational costs – lessens accidents and allows more data integration. Paired with a solar energy production and a reduction in maintenance costs, the incremental mile costs almost nothing, Hausmann said. 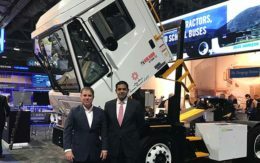 Electric truck maker Workhorse Group has a proven track record in the last mile delivery space. Parcel delivery giant UPS operates more than 300 Workhorse hybrid-electric delivery trucks in its growing fleet of alternative fuel vehicles. 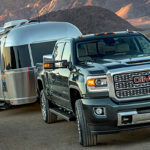 The company also works with Ryder to sell and service its delivery trucks and W-15 electric pickup. But the Loveland, Ohio, company sees the future of last mile in drone technology. Duane Hughes, president and chief operating officer of Workhorse, said it used one of its UPS-owned delivery vans to deploy a package-delivering drone in Tampa, Fla., in February 2017. “It was the first live parcel delivery via drone in the United States,” Hughes said. UPS spends $1 per mile in fuel and maintenance costs to deliver a package with a gasoline version of the vehicle in the drone delivery. Using the electric vehicle drops the cost to 40 cents per mile. Using the drone to deliver a package reduces the cost to 3 cents per mile. Drone delivery for UPS is based first on cost, Hughes said. If a truck has two deliveries in opposite directions, the driver can deploy the drone – or “the bird” – and continue its route to deliver the first package while the second is autonomously sent to its final destination. The bird then returns to its roof-top perch on the delivery truck. “This eliminates the number of miles UPS is driving a 20,000-pound truck around to deliver a package,” Hughes said. Weather can be an issue with flying machines, so having weather info integrated with the electric truck is “the real key to the success” of using drone technology for parcel delivery, Hughes said. Recipients are charged with using Workhorses’ mobile app – Ares – to request approval and then select the exact location where they’d like the package delivered. The app will also let the user monitor delivery of the package in real time. Requiring customer interaction with the app helps Workhorse test whether certain locations are viable for future delivery. Workhorse currently is delivering five packages a day in real-life scenarios in different areas in Cincinnati. It will continue testing over the next three months. Hughes said by the end of 2018 the drone will be in commercial operation. The company works closely with the FAA and has all the necessary approvals, he said. In addition to UPS’ involvement in Workhorse’s drone delivery program, it’s also studying other methods of zero-emission last-mile delivery that involves human-powered machines: bicycles. Urbanization is a challenge for UPS and other carriers as the e-commerce industry grows. By 2050, 70 percent of the world’s population will reside in cities, said Thomas Madrecki, director of urban innovation for UPS. “UPS projects that more than 75 percent of our deliveries will take place in urban areas,” Madrecki said. This poses numerous challenges to the delivery business including “worsening” road and highway congestion, he said. Other issues are safety limitations on vehicle travel and increased city infrastructure that supports walking and biking. UPS started as a bike currier company more than 100 years ago. The bicycle is still one of the world’s most efficient machines, Madrecki said. The ability of bicycles to deliver in urban environments is established, but only in a small segment of the last-mile delivery market. For example, bikes are typically used to deliver items – such as fresh flowers – very quickly. There are challenges when scaling bike delivery from a niche market into something workable for a larger company like UPS. What enables bike delivery to succeed is how the urban environment is shaped, Madrecki said. 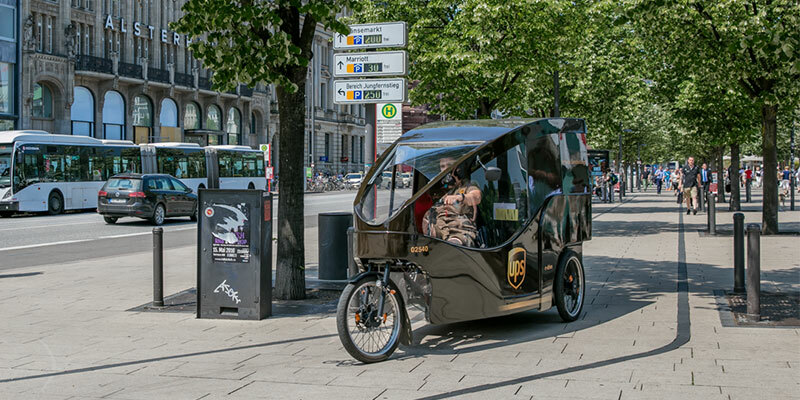 UPS has more than 30 global pilot programs underway to test bike delivery. In one test, a bike and a truck ran side by side to compare “stops per on-road hours,” or SPORH. The bike completed 27 stops versus the truck’s 15. “If we can identify the neighborhood typology where the SPORH is higher for bike delivery, then it’s a matter of how you facilitate that actual delivery downtown,” Madrecki said.